Johnson&Johnson ACUVUE® OASYS 1-Day with HydraLuxe technology Contact Lenses (90 Pack) - A single use, daily disposable lens that offers new HydraLuxe technology which has a tear-infused design that integreates with your own tear film to help reduce symptoms of tired eyes and dryness. Great for people with a busy lifestyle, who want the best for their eyes. 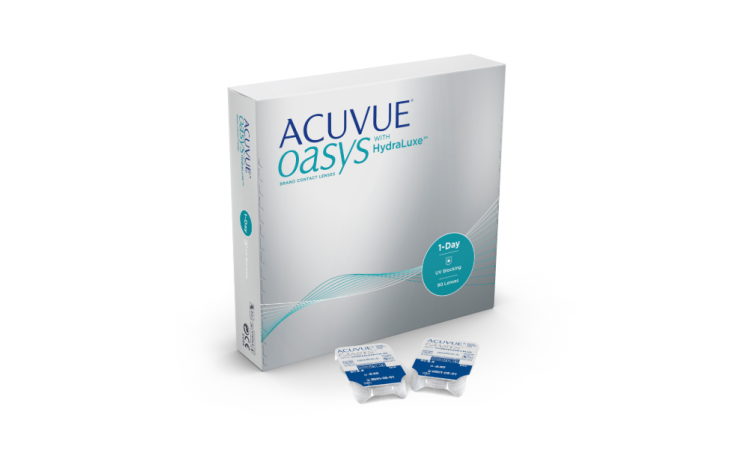 ACUVUE® OASYS 1-Day contact lenses are an innovative contact lens designed to help maintain the natural state of the eye. It’s the lastest daily disposable contact lens made by Johnson&Johnson with a super-breathable silicone hydrogel material that provides performance throughout demanding days.